Florence is a city, and with that comes the people who live there that expect tourism and try to sell you things for too much. The market there was loud and had a lot of people, knick-knacks, and souvenirs. 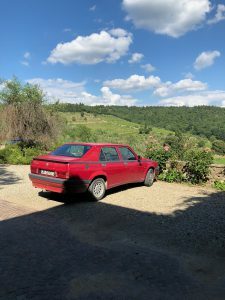 So going to a smaller village outside of the city showed us all a different, more realistic side of hilly Italy. I felt proud of ordering an iced coffee while speaking Italian in this small town north of Sienna that we visited. 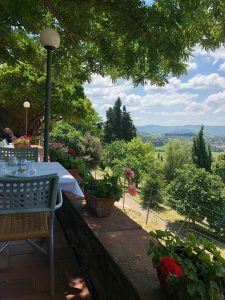 Afterward, we all had lunch together overlooking the atmospheric, rolling hills of the central Tuscany region. Seeing the landscape in person gave me a greater understanding of how Italian paintings are composed, and how photography can only do a portion of what the eye can do. A short nap of the shuttle brought us to our private wine tasting at the Gagliole Winery. Our guide was extremely patient and enthusiastic about her work which was refreshing. Upon leaving, she said I was a gentleman and gifted a bottle opener to me; something I’ll keep forever.